Box Dimensions (LxWxH) 7.6 x 5.7 x 2.1"
i1Display Pro is rated 4.5 out of 5 by 437. Rated 1 out of 5 by William from Disappointed I am a professional photographer with years of color management experience. 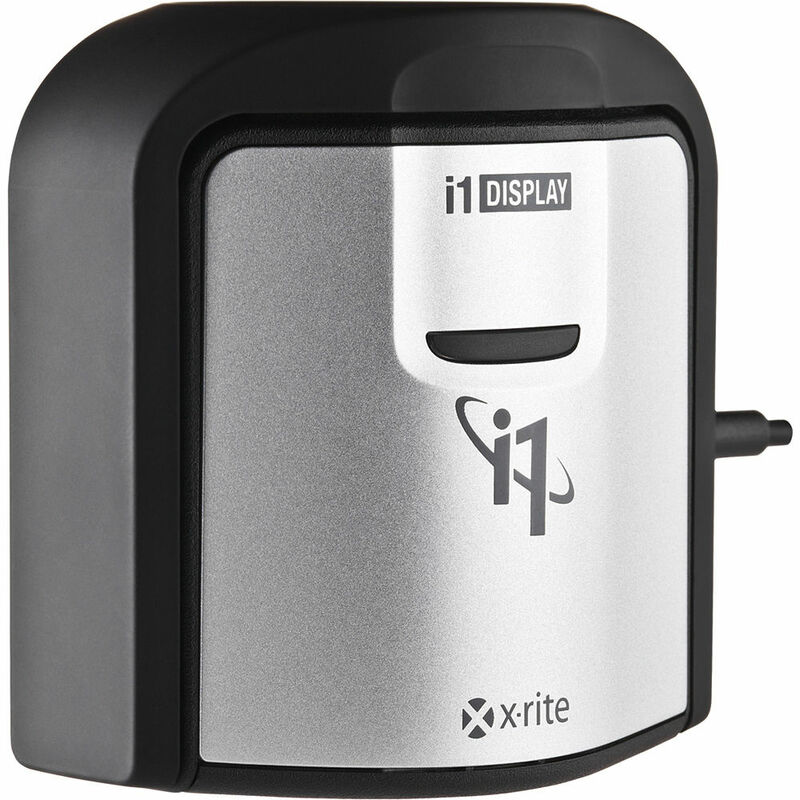 I was in need of a new screen calibrator and decided to get a camera and screen calibrator combination by X-rite. Wow. What a let-down. The screen calibrator was less than intuitive and didn't achieve a good 6500k balance. Finally had to push the balance to 7000k to make it look like a good 6500k. The one really great thing was the 24 color checker by X-rite but their software for making a camera profile made skintones come out reddish and contrasty. Get the Adobe DNG profile editor and use it with the 24 color checker for excellent profiles. Its FREE. Rated 4 out of 5 by Lizzieuribeb from Good I am not expert in color but i do want my screen to be calibrated so that i know that my prints will match what i see on my computer. Instructions and even customer support is not very explanatory. There are a lot of features that you will need to either figure out yourself by watching video tutorials or by reading about color correction and properties. I am not sure that you will be ok by just setting it up on basic mode and just clicking next every time with out changing any setting. With this being said, after a bit of struggle with the product, i ordered a book from Blurb and my pictures came out just as i saw them on my screen. So I am pleased. Rated 5 out of 5 by Daniel from Must have for the working professional It doesn't matter what your field is as long as you make money from working on your computer (if colors are involved)... you need to get your monitor calibrated. This is a must have for any Graphic Designers, Web Designers, Photographers, Videographers, Architects, (the list goes on). Everyone should have a properly calibrated monitor in my opinion. I like that its so darn easy to use too. All it takes is installing the app and plugging the i1 to a USB port and following the step by step instructions in the app (5 minutes tops) to have accurate color representation on screen. You would be surprised by the color shift you might have. Rated 5 out of 5 by Stevan from Works great with BenQ Thanks to Frank Doorhof for recommending this calibrator. Works great with BenQ 27 photography monitor for hardware calibration. I also tried the normal software calibration to compare results. Photos compared to prints looked the same by using either method. Software used by BenQ is very similar to the X rite software so it can be used on other monitors without another learning curve. My previous calibrator was a Spyder 4 which was giving unreliable calibration after 3 years. This was a normal life span for it but the Spyder was a bigger pain to use & also had given me bad calibrations which had to be redone. So for the i1Display Pro is spot on. Rated 5 out of 5 by Ed V from Color Calibration & Luminosity Key to Great Prints I had an i1 Display2 that I purchased quite while back but it was outdated and no longer supported by X-rite. So I upgraded to the i1 Display Pro. I will admit that I did a lot of prep work before purchasing (i.e. watching videos, tutorials, reading reviews and even talking to the folks at X-rite who were very helpful). I looked at the ColorMunki offering as well but ultimately decided on this alternative. I found it very easy to set up using the advanced option straight out of the box . The color calibration as well as (and particularly) the luminosity adjustments were just what I needed. My screen was too bright and as a result the prints were darker than what was being seen on screen. Rated 3 out of 5 by Bob R from Good product, poor documentation After getting Display Pro to work (which took a lot of trial and error), I would rate its performance as Good, though a notch less than excellent. The print now looks pretty close to what the screen shows, though the colors are still slightly off. The reason it took a lot of effort to get it to work at all is that there is no documentation to speak of in the box, and the disc has multiple websites it suggests you try. I finally found an article by x-rite called Monitor Profiling with i1 Profiler which was detailed and quite helpful. Even here though, what actually happens during profiling isn't exactly what the article indicates. As a result, when finished, the user is unsure he is. Rated 4 out of 5 by Ted from Works with Dell Over the last few months, a number of people have reported difficulties getting the Dell UltraSharp Color Calibration Solution to work with the required i1Display Pro colorimeter. I can report that I installed the Dell software (version 1.01.1.251) on a Windows 7 system and ran the calibration on my Dell U2413 with no problems whatsoever. I also installed the X-Rite software that came with the i1Display Pro on another computer (Asus laptop). While the X-Rite calibration software installed and ran fine, I agree with those who complain that it could use some design tweaking to make its interface more intuitive, user friendly and less cryptic. I have my Eizo Color Edge CG223W connected to a 2012 Mac Tower. Before I had to disconnect the monitor cable and connect the monitor with a USB to be able to calibrate. Is this still the case with the newer units? March 2016: Is there an update on whether it will calibrate the Hp Dreamcolor LP2480zx monitor? Previous posters have stated that it does not because the software has not been updated, but those were from last year. According to the manufacturer, an update has already been released. I have read that Dell U2413 wide gamut monitor uses its own Dell software to calibrate. Is that so? Correct because only dells calibration software contains specific drivers for these Dell monitors. So you would only get software calibration not hardware from the x-rite included application. You would have to pair it with dells Dell UltraSharp Calibration Solution to get a desired result. Will this calibrate a Plasma TV (50ST60) to rec. 709? and can it calibrate up to DCI P3 standard for the LG 31mu97c-b? This device calibrates computer monitors only. Will this work with El Capitan/Mac OS 10.11? I currently have ElCapitan on my McBookPro and can't upgrade as it causes some other software conflicts- will this program work with ElCapitan? El Capitan is version OS MacOS X 10.11x. And X-Rite can work in that OS. Do you deliver in Philippines? Yes, we ship many items to the Philippines. You may calculate your actual shipping options/order totals by adding the items you want to a shopping cart. It will then list the shipping options, descriptions, ETA's and fees to your location. Will this work with Viewsonic VP3268? VP2768? VP 2780? Yes, it should work fine with those monitors.